The Wayback Machine is a digital San Francisco, California. It was set up by Brewster Kahle and Bruce Gilliat, and is maintained with content from Alexa Internet. The service enables users to see archived versions of web pages across time, which the Archive calls a "three dimensional index." Since 1996, they have been archiving cached pages of web sites onto their large cluster of Linux nodes. They revisit sites every few weeks or months and archive a new version if the content has changed. The intent is to capture and archive content that would otherwise be lost whenever a site is changed or closed down. Their grand vision is to archive the entire Internet. The name Wayback Machine was chosen as a droll reference to a plot device in an animated cartoon series, The Rocky and Bullwinkle Show. In one of that animated cartoon's component segments, Peabody's Improbable History, lead characters Mr. Peabody and Sherman routinely used a time machine called the "WABAC machine" (pronounced "Wayback") to witness, participate in, and, more often than not, alter famous events in history. In 1996 Brewster Kahle, with Bruce Gilliat, developed software to crawl and download all publicly accessible World Wide Web pages, the Gopher hierarchy, the Netnews bulletin board system, and downloadable software. The information collected by these "crawlers" does not include all the information available on the Internet, since much of the data is restricted by the publisher or stored in databases that are not accessible. These "crawlers" also respect the robots exclusion standard for websites whose owners opt for them not to appear in search results or be cached. To overcome inconsistencies in partially cached websites, Archive-It.org was developed in 2005 by the Internet Archive as a means of allowing institutions and content creators to voluntarily harvest and preserve collections of digital content, and create digital archives. Information had been kept on digital tape for five years, with Kahle occasionally allowing researchers and scientists to tap into the clunky database. When the archive reached its fifth anniversary, it was unveiled and opened to the public in a ceremony at the University of California-Berkeley. Snapshots usually become available more than 6 months after they are archived or in some cases even later, 24 months or longer. The frequency of snapshots is variable, so not all tracked web site updates are recorded. There are sometimes intervals of several weeks or years between snapshots. In October 2013 the company announced "Save a Page" feature which allows any user to instantly upload and publish any webpage or a binary file. This became a threat of abuse the service for hosting malicious binaries. In Europe the Wayback Machine could be interpreted to violate copyright laws. Only the content creator can decide where their content is published or duplicated, so the Archive would have to delete pages from its system upon request of the creator. The exclusion policies for the Wayback Machine can be found in the FAQ section of the site. The Wayback Machine also retroactively respects robots.txt files, i.e., pages which are currently blocked to robots on the live web will be made temporarily unavailable from the archives as well. ^ "'"The Internet Archive: Building an 'Internet Library. Internet Archive. November 30, 2001. Archived from the original on 2001-11-30. Retrieved May 12, 2013. 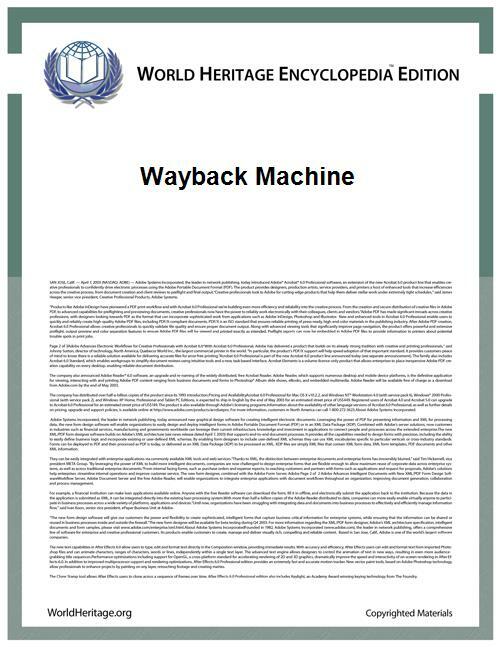 The Wayback Machine was unveiled on October 24th at Berkeley's Bancroft Library. ^ "Archive.org or Wayback Machine". http://cachedpages.net/. Retrieved 2 December 2014. ^ Green, Heather (February 28, 2002). "A Library as Big as the World". BusinessWeek. Retrieved 2007-07-29. ^ Kahle, Brewster. "Archiving the Internet". Scientific American – March 1997 Issue. Retrieved 19 August 2011. ^ Cook, John (November 1, 2001). "Web site takes you way back in Internet history". Seattle Post-Intelligencer. Retrieved 15 August 2011. ^ "Internet Archive FAQ". Archive.org. Retrieved 2014-04-16. ^ Mearian, Lucas (March 19, 2009). "Internet Archive to unveil massive Wayback Machine data center". Computerworld.com. Retrieved 2009-03-22. ^ Kanellos, Michael (July 29, 2005). "Big storage on the cheap". CNET News.com. Archived from the original on 2007-04-03. Retrieved 2007-07-29. ^ "Internet Archive and Sun Microsystems Create Living History of the Internet". ^ "Updated Wayback Machine in Beta Testing". Archive.org. Retrieved 19 August 2011. ^ "Beta Wayback Machine, in forum". Archive.org. Retrieved 2014-04-16. ^ "Wayback Machine: Now with 240,000,000,000 URLs | Internet Archive Blogs". Blog.archive.org. 2013-01-09. Retrieved 2014-04-16. ^ a b c LLoyd, Howard (October 2009). "Order to Disable Robots.txt" (PDF). Retrieved 2009-10-15. ^ Cortes, Antonio (October 2009). "Motion Opposing Removal of Robots.txt". Retrieved 2009-10-15. ^ Gelman, Lauren (November 17, 2004). "Internet Archive’s Web Page Snapshots Held Admissible as Evidence". Packets 2 (3). Retrieved 2007-01-04. ^ Howell, Beryl A. (February 2006). "Proving Web History: How to use the Internet Archive" (PDF). Journal of Internet Law: 3–9. Retrieved 2008-08-06. ^ Wynn W. Coggins (Fall 2002). "Prior Art in the Field of Business Method Patents - When is an Electronic Document a Printed Publication for Prior Art Purposes?". USPTO. ^ "Debunking the Wayback Machine". Archived from the original on 29 June 2010. ^ Bowman, Lisa M (September 24, 2002). "Net archive silences Scientology critic". CNET News.com. Archived from the original on 2012-07-16. Retrieved 2007-01-04. ^ Miller, Ernest. "Sherman, Set the Wayback Machine for Scientology" (Blog). LawMeme. Yale Law School. Retrieved 2007-01-04. The posting is billed as a 'feature' and lacks an associated year designation; comments by other contributors appear after the 'feature' . ^ Bangeman, Eric (August 31, 2006). "Internet Archive Settles Suit Over Wayback Machine". Ars technica. Retrieved 2007-11-29. ^ Claburn, Thomas (March 16, 2007). "Colorado Woman Sues To Hold Web Crawlers To Contracts". ^ Gary Price (September 18, 2005). "Yahoo Cache Now Offers Direct Links to Wayback Machine". Search Engine Watch.